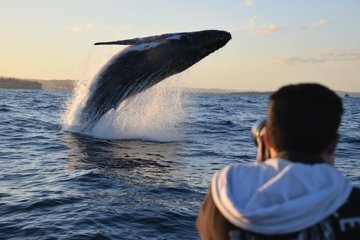 Experience a close encounter with humpback whales without having to leave the city on this thrilling 2-hour speedboat tour from Sydney. Hop on-board the city’s fastest commercial ship and blast off across Sydney Harbour, past iconic landmarks like Sydney Harbour Bridge and the Sydney Opera House. Leave the city behind and speed out into the Pacific Ocean, where you’ll have chance to spot majestic whales swimming and playing in their natural environment. Loved the trip, Blake was very friendly and informative, we got to see a dolphin, some whales which was well worth seeing, on the way back we saw some new Zealand fur seals. If you get sea sick then take travel sickness tablets and sit in the middle of the boat for the back of the boat. Brilliant way to see the whales off Sydney. Our guide Blake was very informative and had a brilliant eye for spying the whales. Only took about 10 mins, when we did hit the open sea, to see some humpbacks. 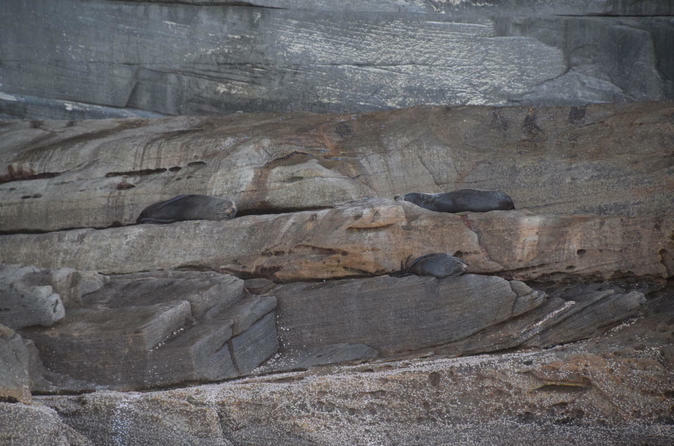 Also saw dolphins and brown seals. Fantastic to see these creatures in their natural habitat. Absolute wonderful experience, completely recommend. Driver was great, good knowledge. nothing to fault. We saw many Wales, one group check us out from one side of the boat to the other, it was memorable the boat ride was fast and very scenic. The time does go by very quickly. This was a great trip! Fun boat ride, amazing experience.Captain Blake provided information which was interesting and entertaining. The tour was simply amazing! Our guide was extremely nice and since it was very windy that day, he also offered us to go on a day with less wind. The speedboat ride itself was fun too, but I would recommend to bring chewing gum if you get seasick easily. All in all: awesome tour, I would definitely do it again!